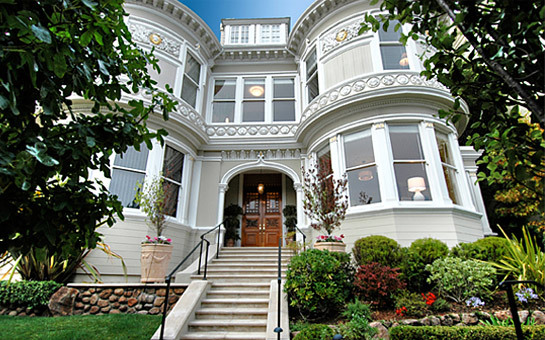 San Francisco Properties: Luxury homes of San Francisco. Lot Size 8,777 sq. ft. The property at 2220 Sacramento is a registered City Landmark, No. 119, and is cited in Here Today, San Francisco’s Architectural Heritage, Chronicle Books, 1968. This remarkable home was built in 1887 and known as the Chambers mansion, named after Richard Chambers, a silver tycoon and U.S. senator. Over the years, it was known as the Mansions Hotel. In 2002, it was converted into two large homes, lovingly restored and renovated with all the modern conveniences. No. 2220 occupies the eastern half and presents as a single family home in a gated setting. Enter through the secure wrought iron gates past the landscaped garden with perennials, flowering bushes and seasonal blooms. Intricate plaster and carved ornamentation—blossoms, leaves, acorns & angelic faces—adorn the entablature of the Neo-classical façade, along with graceful bay windows and dentils at the roof line. Handsome tall double doors with transom greet the visitor at the porch entrance. The warm and inviting FOYER is representative of the fine architectural qualities found throughout the home including: tall ceilings & doorways, deep crown molding, white enameled wainscot paneling and beautiful hardwood floors with inlay. Abundant natural light floods the beautifully proportioned rooms all day long. The light & airy LIVING ROOM features a marble fireplace, curved bay windows which look out to the landscaped garden, and square bay which houses a grand piano. The formal DINING ROOM comfortably seats a large dinner party and features a handsome marble fireplace with an intricate wood carved mantle. The spacious designer KITCHEN/FAMILY ROOM is the informal heart of the house. Two sets of tall French doors with transoms open to the landscaped terrace graced by a pair of Doric columns for alfresco dining, entertaining and play. Seller's extensive list of custom improvements to the property is available in the Disclosure Package. The POWDER ROOM with pedestal sink and guest closet off the foyer complete this level. Ascend the handsome, original grand staircase from the Chambers’ era with leaded glass triptych and crest inlays at mid-landing to the bedroom level. The substantial MASTER SUITE with bay window seating provides a tranquil setting. The seating areas are framed by a Doric column and double box-beamed ceiling; French doors open to a charming balcony from the bedroom. The luxurious MASTER BATHROOM features marble surrounds, fireplace with hearth seating, double vanities, spa tub and separate shower. The dressing room provides ample custom storage for his & her wardrobes and accessories. Two sunny BEDROOMS and two tiled BATHS complete this level. Ascend the staircase with built-in bench seating at mid-landing to the spacious and inviting FAMILY/MEDIA ROOM with gabled ceiling and fireplace. A large LAUNDRY closet houses washer & dryer. Two charming gabled BEDROOMS and two tiled BATHS complete the top floor. Taxes will be reassessed upon the sale to approximately 1.163% of the purchase price. Prospective Buyers are advised to review, prior to any offer, the Property Disclosure Package available on request. The lower level features a spacious AT-HOME OFFICE, pantry, wine room & utility room. There is convenient inside access from the two car side-by-side GARAGE to the kitchen and upstairs. © SF Properties 2009. All Rights Reserved.